So you’ve decided to go to the Vegas Shoot? Good for you! If you’re fortunate enough to be within driving distance, this is merely an exercise in normal tournament logistics (perhaps with a stopover for the more distant but adventurous types). As with any tournament, proper packing is in order, preferably the night before departure. Pack water/liquid bottles and small snacks for physical maintenance during the shoot. Consider taking spares of anything important but affordable – arrows, nocks, finger tabs, stick-on rests. The list will vary by budget and bow type. Definitely consult with your coach. Cash. You never know when equipment calamity might strike, and a small repair might make the difference between victory and defeat. Although credit is quickly becoming king, cash is easiest when dealing with a one-time emergency at an unfamiliar bow shop. 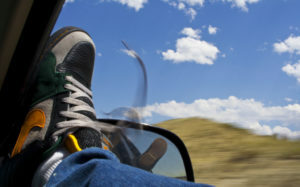 Other than the perennial road trip question, “Are we there yet?? ?” you drivers pretty much have it made. But what about the flyers or the rail/bus travelers? 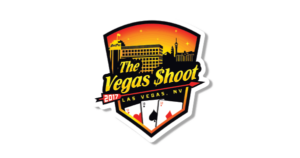 This presents a specific problem – how to get the bow (and the non-TSA-friendly arrows) to Las Vegas? The watchword of archery baggage is sturdy. Hand carry is definitely not an option, and your usual softcase, backpack, or knock-about-town hardcase isn’t going to suffice. You need something that can take some abuse, and let your bow live to tell about it. Remember the American Tourister Gorilla? That’s what you’re up against, folks. Multiple handles for carrying options. Retractable handles are especially nice. 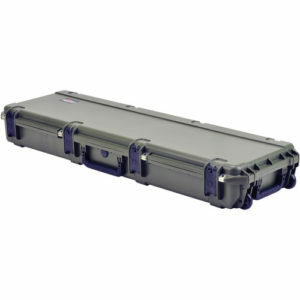 At Goodwin Archery, we use the SKB 5014 long case, on the advice of our local bow techs at H&H. 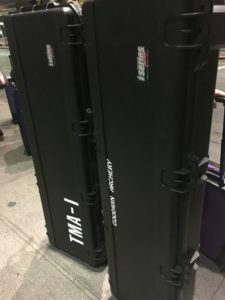 We have used the cases on two plane trips and two road trips, and have had zero problems with them. However, a word of warning – try before you buy. Specifically, make sure your bows will fit, especially for target compound shooters. This SKB model was the only one of their models that fit the axle-to-axle length of my previous bow, a Hoyt Podium-X 41. 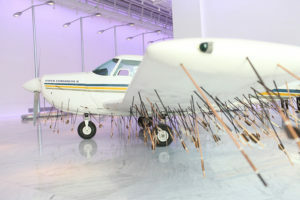 One last bit ofadvice – be aware of the archery gear policy of your airline or overland travel provider. Fortunately, even in this era of travel security concerns and shifting TSA guidelines, most airlines have very reasonable policies regarding bow travel. A comprehensive summary of policies by airline can be found at the Airline Baggage Fee site. However, to be absolutely certain, check with your specific carrier for their up-to-date guidelines. Goodwin Archery has flown with Southwest Airlines and American Airlines, and both were extremely courteous and professional! Understand that you will be checking these bags with checked luggage, so any baggage handling fees will definitely apply. Most carriers will not charge extra for equipment provided it does not exceed certain dimensions or weight. (Warning – major fees await you if your case exceeds 50 pounds – weigh in advance!) Be especially careful to include any sharp archery-related objects in the bow case, not in your carry-on luggage, including pointed tools, spare arrow points, spare rest blades, and the like. Be prepared for some questions about your gear – what is it? What are you doing with it? You may even get some silly questions – USAT team member Kathleen Stevenson was once asked if the bow was unloaded. (“Umm, well, I’m not holding it, so…) Do recognize that these people are simply doing their jobs to keep everyone safe. Use the opportunity to be a good ambassador for the sport. I’ll say something like, “This is my precision target bow that I’m taking to the Vegas Shoot, the largest and most prestigious indoor archery tournament in the WORLD! ™” Or something like that. For the uninitiated, long-distance travel with a bow and arrow can be daunting and uncertain. Rest assured, with proper information and preparation, it can easily be the least of your tournament worries. If Goodwin Archery can do it (as evidenced by the photo, taken at Las Vegas McCarran Airport), then you can too! This article is second of a five-part series. Be sure to check back for more! Excellent article! I wish we would have had this to read back when we started traveling.